I made this cake with flowers two days ago and the flowers that you see on the cake were also made by me using gum paste. My passion is baking and decorating cakes and even when I am asleep I dream of cakes :) I love doing the art work for the cake and someday want to be recognized as a pastry chef:) That's my dream come true. This was entirely my creation. I made the cake from scratch and for the filling I made strawberry and fig icing. A unique flavor but delicious! I made the gum paste flowers using 50/50 fondant and gum paste so that the flowers would not crack after drying. It took me five hours to finish all the gum paste flowers and once they were dried I used airbrush to color them then painted the edges with petal dust. The final coat was of confectioners glaze for the shine. I was pleased with the outcome and I know that hard work pays off. My instructor was very pleased with my work too. I even dream about cakes and having my own pastry shop someday So never stop dreaming your dreams and keep on trying and with practice you will succeed. I thank you Lorelie for accepting my cakes here on her web page. Thank you all for your support and it means a lot to me. Thank you Meena for your gorgeous cake with flowers. The colors are so beautiful. You keep up the good work. You will have your pastry shop someday. The fig and strawberry filling sounds amazing. Would you like to share the recipe with us? Thanks for your contributions to this web site. 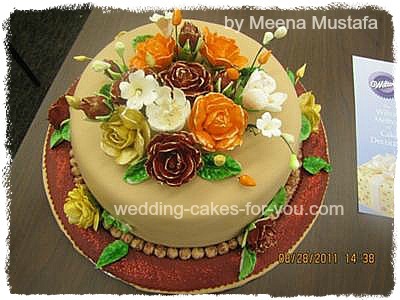 Here are the links to Meena's other submissions..
You make the best cakes in taste and design. I wonder who in the world would want to cut this beautiful cake. Love you Mom. There is only one word for this ..'a masterpiece'.. The flowers look so realistic and festive and the whole color scheme is outstanding. Surely a success esp since you said you recently started cake decorating. You not only made a beautiful cake, but have given a beautiful bold color concept, the color and flowers with petals & buds give a beautiful bold look. The flowers really look natural. you are very creative. Keep up the good work, wish you best of Luck. I admit this is the best cake I have ever seen. The architecture is amazing. The flowers are very charming and designed perfectly. I love this cake, I have birthday in next month I would like to have this cake on my table. This is not just baking, it's art from a very talented artist. I would suggest to WEDDING CAKES FOR YOU to make this your logo. it will be rocking. A beauty of flower arrangements on a cake..Wow! Wow!When I saw the cake with the beautiful floral decoration I couldn't believe it was gum paste!I really mistook it for real flowers!I must say it is so very pretty that it would be hard for me to even cut it! This is surely the work of a professional!Keep it going Meena!You are bound to carve a niche for yourself in this field!Don't ever give up! Great cake. Very nice work. Beautiful color combination. Wow!Wow!Wow!...Meena you did it once again but his time even better....your true passion for cakes can surely be seen in this gorgeous flower cake. But his cake is even more unique to me because of the ingenious flavor you have created....I have to say absolutely amazing combination or Strawberry and Fig!...So classy...so 'unboring'!...your cakes always have this delightful surprise in them...almost like opening up a Christmas Gift!....And this is what makes MEENA'S cake apart for all...cause Meena always adds her secret ingredient....a touch of Meena's Magic. I am so proud of you Meena!! !I wish you all the success in the world and may your passionate dream come true!!!! Very beautiful and lovely looking cake..i wish i could taste it as well and tell how good it tastes..you have done a good job..wish u best of luck for your dream..